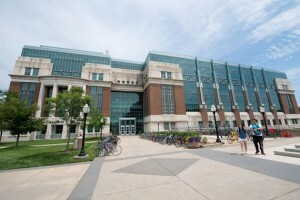 The Animal Science research program at the University of Nebraska-Lincoln is conducted through some 30 externally and internally funded projects managed under the Agricultural Research Division of IANR. Research activity ranges from basic molecular biology aspects of genetics/genomics/functional genomics and physiology to applied aspects of breeding and genetics, nutrition, meat science and processing, growth, heat and cold stress, production and management strategies and integrated interdisciplinary beef systems projects. Significant collaborative research is conducted in the areas of pre-harvest food safety, nutrient and waste management, animal health, and beef production systems. Interdisciplinary research is encouraged and support is provided for joint projects across departments and between multi-state project participants. Research is conducted in vivo in small animal, poultry and livestock housing laboratories in Animal Science, at all of the animal units managed by the Department, and at facilities owned and managed by cooperating producers. Cell, embryo, and tissue culture work is also conducted.